Scrap and Stamp with Friends: All Grown Up! Time for a new challenge at Elisabeth Bell's World.......we would like to see stitching--real or faux along with swirls!!! For my card today I did use the adorable stamp "All Grown Up" by Elisabeth Bell exclusive for SCACD. She is coloured with Copics and Yeppyyyy I did made an Easel card, again :) Love it! Well girls just ink any Elisabeth Bell image, you can also use her adorable digi images HERE and come join us this month. We will be really happy to see your amazing projects. Our sponsor this month is Michelle's Scrapbooking & more. For more inspiration and to join the challenge the place is HERE! Paper Crafting Journey - Make it Cute! Wish you all an amazing weekend! Oh dit is zo schattig Renkata en leuk zoals je haar ketting gemaakt hebt! Just love this Elizabeth Bell image! You did a super fab job as usual Renkata! Love your work! A big fan! Wow superb creation ! Love this little image, and the necklace, oh sooo cute ! Awww!! Your coloring is as stunning as ever!! And I love the pearls around her neck!! TFS!! She is adorable and the card you made around her is so nice. Loe the colors and textures of all your details, just lovely. 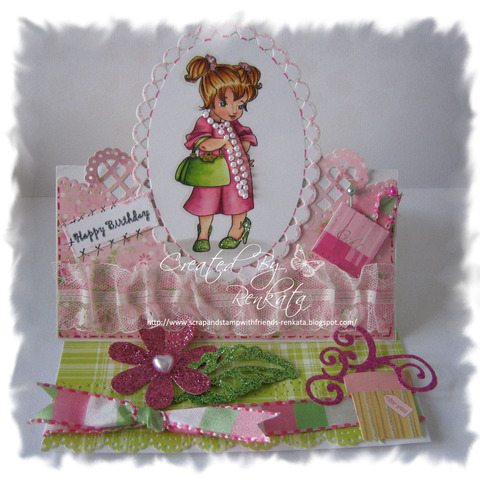 Sweet card and just love how you've colored the image and the pinks and greens are just spot on perfect together! Ренка, невероятно сладурска картичка! Не мога да се нарадвам на тази очарователна госпожица и всички детайли, които са прооосто перфектни! И много хубав перлен гердан си й направила! gorgeous, so many fabulous details...hope you have a wonderful week! Awww I love her necklace. What a cute addition. Great job. Thank you for joining us at Allsorts this week and good luck! Digital Delights have new Release!!!! !